Eating Ice Cream and Getting Wet – Where is Lydia? Ice cream is by far my all time favorite food. I had heard about this amazing ice cream place from one of the employees at my casa called Coppelia. Apparently for only 5 CUP, a little less than .25 cents you could get a huge bowl with 6 scoops of ice cream. A little side note, CUP is different from CUC. CUP are Cuban pesos, the national money that is to only be used by Cubans. There are roughly 24 CUP to 1 CUC. Tourists use CUC and generally pay more for things. I met my Cuban friend Leduane and his sister for ice cream. When I arrived at Coppelia I was in awe from its size. It was a large circular building on spider legs with a grand winding staircase leading up to it. It was like a building from a science fiction movie. There was also outdoor seating circularly surrounding the building. All in all this place could seat well over 1000 people. We all ordered something called an ensalada which is 6 scoops of different ice cream flavors. It was amazing and after I was finished I wanted more but we decided to walk down to the Malecón. 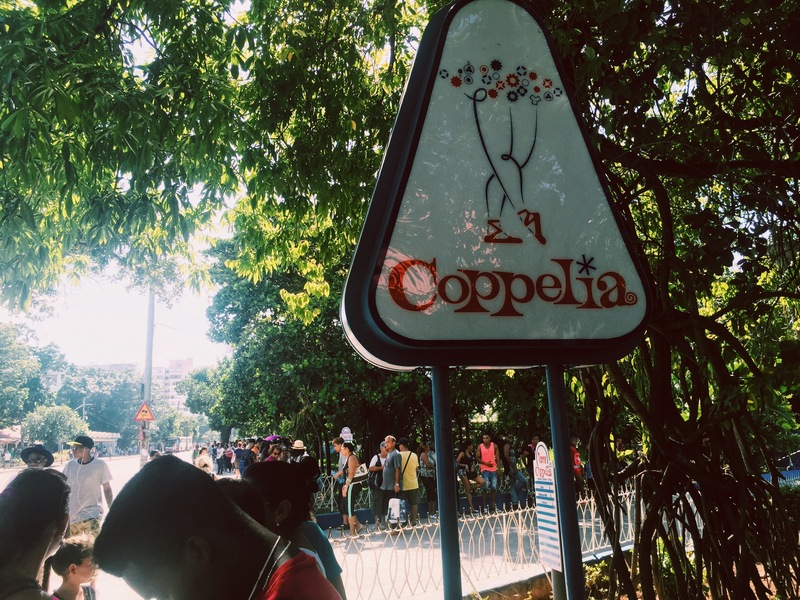 Apparently this is a very typical Cuban date – to get ice cream at Coppelia then walk down to the Malecón to meet up with friends or make out. Hurricane Matthew was getting closer and due to the hurricane, Cuba was having high winds and intense rain storms. Normally on any given weeknight there are at least 500 people hanging out on the Malecón. On the weekends it’s well into the 1000s. After about 20 minutes sitting on the Malecón the winds picked up and we got caught in a heavy downpour. All the sudden you could see hundreds of people running from the Malecón for cover. I was completely soaked in less than 2 minutes. We ended up waiting out the rain with about 100 other people under the cover of a gas station. Someone starting playing Work by Rihana on their boom box and everyone started dancing. Even during a heavy downpour Cuba knows how to party.